A deliciously crunchy and slightly sweet Paleo treat. Enjoy it by the handful or as a crispy topping for everything from smoothie bowls to Greek yogurt! Preheat oven to 325 degrees and line a baking sheet with parchment paper or a silicone baking mat. Combine all ingredients in a large bowl and stir until small chunks begin to form. The mixture should be moist and slightly sticky. Remove from the oven and allow coconut to cool and crisp up a bit before eating. 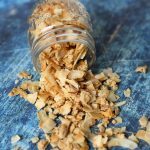 Please note that the recipe calls for unsweetened coconut flakes and not shredded coconut. You definitely want to use the larger flakes in this recipe! (They are sometimes called coconut chips but make sure that the only ingredient is coconut.) Unsweetened coconut flakes can be a little trickier to find but they’re almost always stocked at my local Whole Foods. You may also find them on Amazon or Thrive Market.